To mark Seed Week here in Scotland, it feels only fitting to begin with a celebration of our national staple: the potato. 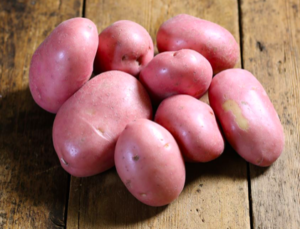 There are potato – or “tattie” – days galore this month. Just a fortnight ago, 500 people attended the Potato Day on the Black Isle organised for the ninth consecutive year by Transition Black Isle. A well laid out hall with descriptions and photographs of each of the 72 different potato varieties on offer, of which 19 were organic (including several Sarpos, a unique family of varieties developed for their superb taste and resistant to potato blight) and 14 were grown locally. Scottish names like Arran Pilot, Pentland Javelin, Bonnie, Highland Burgundy Red, Pentland Crown and Shetland Black conjured up a rich sense of their heritage. A sheer six minutes after opening at 11am the hall was FULL! People had travelled from as far away as Helmsdale and Newtonmore, and not for the first time. It was so incredibly encouraging to see such interest in and knowledge of practical agricultural diversity (i.e. quality seed potatoes!). The seed swap corner was also very busy and there was free expert advice on growing your own. Could this just be the best potato event in Scotland? Moving on to a vegetable no less hardy, one of the oldest surviving seed saving traditions in Scotland is of cabbages, with the popular Shetland cabbage or Shetland kale. The word ‘kale’ – or kail, cale, keill, kell or kil as it was once known in regional dialects – meant any meal or dish, so widespread was the use of kale. With a pre-fix you could start a whole series of new dishes: nettle kail, pea kail, kenny kail. Quite a few of the growers who attended seed trainings last year were considering growing kale for seed, and not surprisingly so, as it does really well in Scottish soil. There is no doubt there is a lot of culture in agriculture, just as these lost names give the clue. Another main staple, oats, has a huge diversity in vernacular names that can be heard around in Scots/Shetland dialect and Norse/Gaelic – oats/aets/havr/coirce. Crofters on the Outer Hebrides and Shetland still have the skills and knowledge to seed save under harsh and challenging conditions. 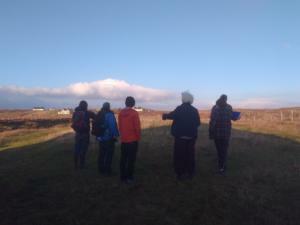 Preserving and transferring this knowledge is critical, and through the Seed Sovereignty Programme we’ve been able to organise crofter-to-crofter knowledge transfer and sharing. 2019 will see novice cereal growers sowing and hopefully harvesting the seed. Did you know that the only remaining Scottish seed producers association is the Scots Timothy Seed Growers, who maintain a grass landrace of over 150 years old? There were once many more seed grower associations (Kent White Wild Clover and the Rye Association in Romney being one of the more famous) but many, much like the traditional names for tattie and kale, have since died out or are about to disappear. It is exciting to see a new interest in seed producer groups emerging in Scotland, encouraged by the Seed Sovereignty Programme. Some small-scale commercial vegetable growers are now thinking about seed saving groups – to save money and to let varieties adapt to local, Scottish growing conditions; whilst other groups have started thinking of community seed banks as part of efforts to build climate resilience, and as community action building. 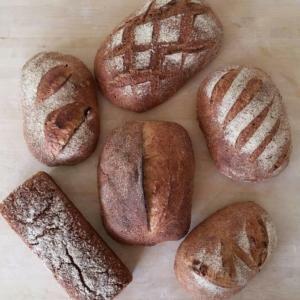 Scotland the Bread have repatriated & developed new Scottish heritage wheat seed mixtures with heritage wheat varieties Rouge d’ecosse, Golden Drop and Hunter’s. These were carefully investigated and sourced from genebanks as far as Russia and multiplied by community groups, in allotments and by veg growers. The website crucially says: “Scotland The Bread flour comes from varieties that were once used to make much of the country’s daily wheaten bread. So it’s not true, as some say, that ‘you can’t make bread from Scottish wheat’”. This is what seed sovereignty is all about: finding out what works locally, for small-scale production, and in a specific community, often against the odds. And finally, for those of you who are keen vegetable growers looking for local Scottish seed, aside from attending local seed swaps and fairs, there are enormous, invaluable vegetable seed and seed potato collections held at SASA at Gogarbank, just outside of Edinburgh. Not many people know this, and it is really important work to conserve older, mostly Open Pollinated varieties with relevance to Scotland and through membership, in order to keep varieties on the market. This is especially relevant for small-scale growers who cannot afford their own private seed store or wee genebank.